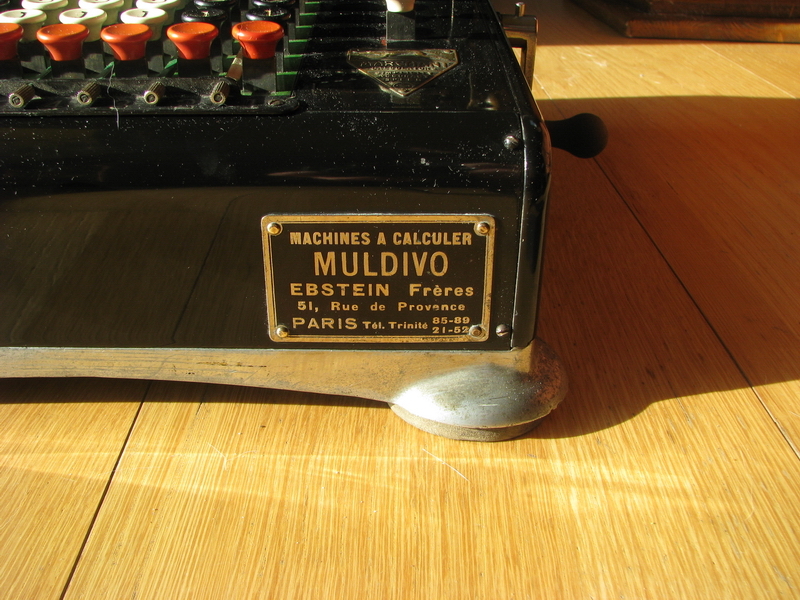 When I went to Paris to see Yves' and Valéry's talk on calculating machines, I also looked on french second hand sites to see if I could find something interesting, and luckily, I could indeed. 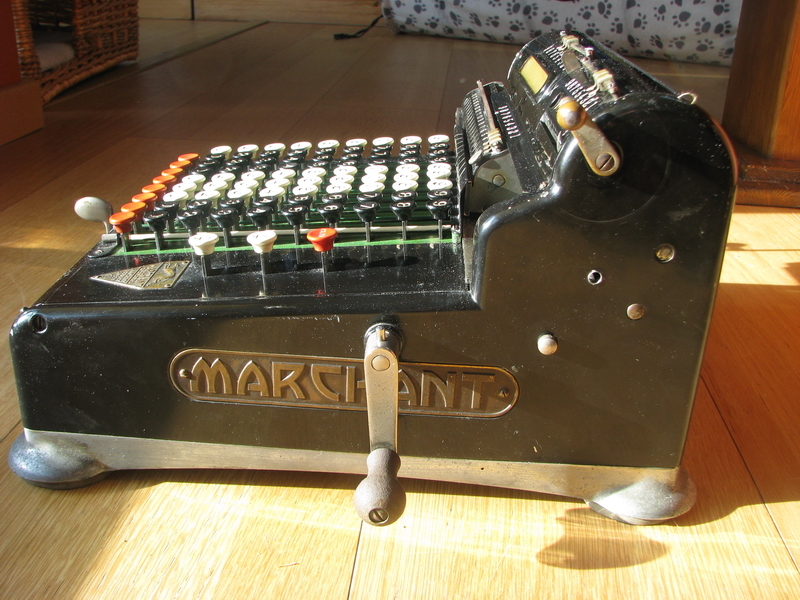 As already mentioned in the article on the Marchant EEG, I would really like a hand-cranked Marchant keyboard machine, and H8 or H9 (the number points to the number of keyboard columns). Chance would have it that someone within easy reach of the library where the talk was taking place was selling a Marchant H9, so needless to say, I made an appointment to go and see the machine. The condition was a little disappointing, and the machine was blocked completely solid. Usually this is something simple though, and with my experience in disassembling, timing and reassembling the Marchant Twinplex, I thought the added complication fo a keyboard wouldn't be too bad. So I bought the machine. The fact that the talk was in January, and the machine only appears on the website now, at the end of March, should probably tell you something about how easy it was to get it working again (or how busy things are at work ...). Restoration and repair as always starts by taking the covers off the machine, and judicious wiggling of everything that can be reached to see where the blockage is. The machine freed up, but would consistently block at one quarter of a turn in the forward direction, and three quarters of a turn in the rearward direction. I couldn't really see what the issue was though. It appeared to have to do with the position of the carriage, and also with the counting mechanism. When a position of the carriage where the machine could be turned through with some force started yielding metal shavings, it became a bit clearer what the actual problem was. 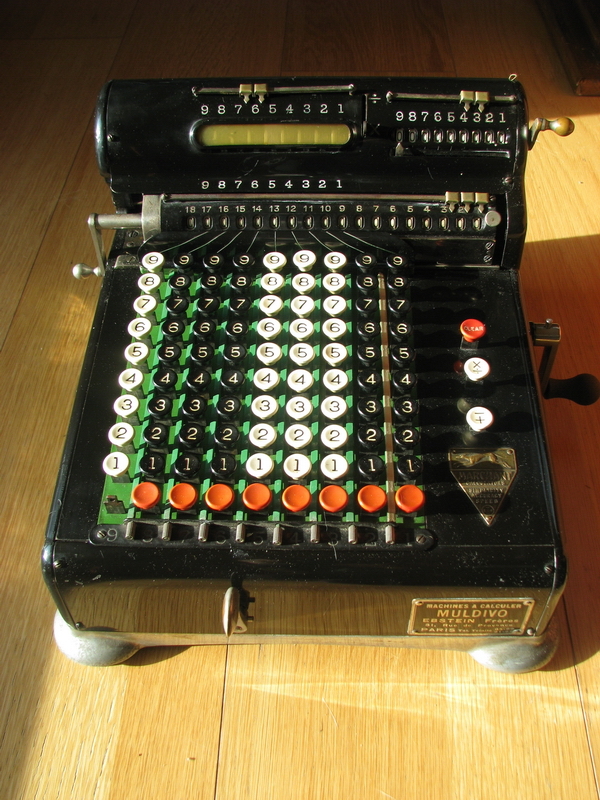 The counting tooth was somehow contacting the tens' carry cylinder in the counting register. This is supposed to be absolutely impossible, but careful consideration revealed the reason, and I fear now that the reason is exactly the same one as why the electric EEG machine currently cannot be made to do anything - the tens' carry cylinder is a zinc casting (Zamac or Mazac), which is notorious for swelling and cracking over the course of time - and that is exactly what this one did. Here it is, after removal from the machine - I am getting ahead of myself with regard to the rest of the story! As a result, the diameter had become substantially larger, and this tens' carry roll would no longer clear the counting tooth, so I took out my set of course miniature diamond files to remedy the situation. All said and done, not all of the tens' carry pins would easily move in their slots either, so this didn't get me much further. Clearly, that is a disaster, because it means that the entire machine needs to be taken apart, and a replacement part sourced. Luckily, one of my drawers contained a sacrificial Marchant XL, and the part turns out to be identical, and more importantly, in good condition. So at least that issue was solved. The disassembly though ... well, I'll just show you a few pictures of the mayhem that ensued. 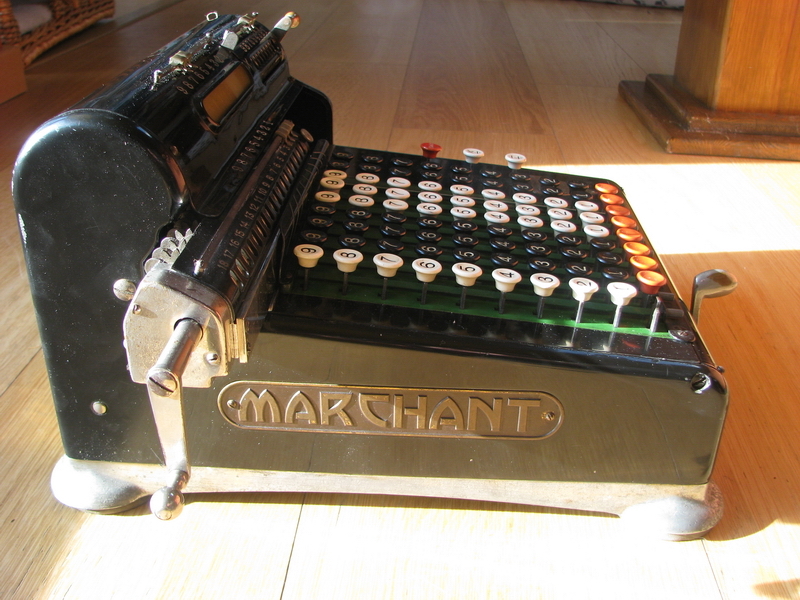 For stories on how to get a disassembled Marchant into a working state again, see the Twinplex story. The only difference is of course the presence of a keyboard in this machine. 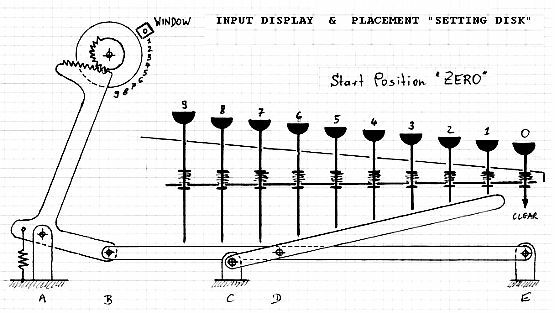 The keyboard works by the keystem pressing down on a system of scissored bars, the end of which then moves proportionally up and down. It is linked to a different lever, which connects over a pivot point to a geared sector, which then in turn rotates the setting disk from the rear of the machine - essentially what you do manually in an XL machine. 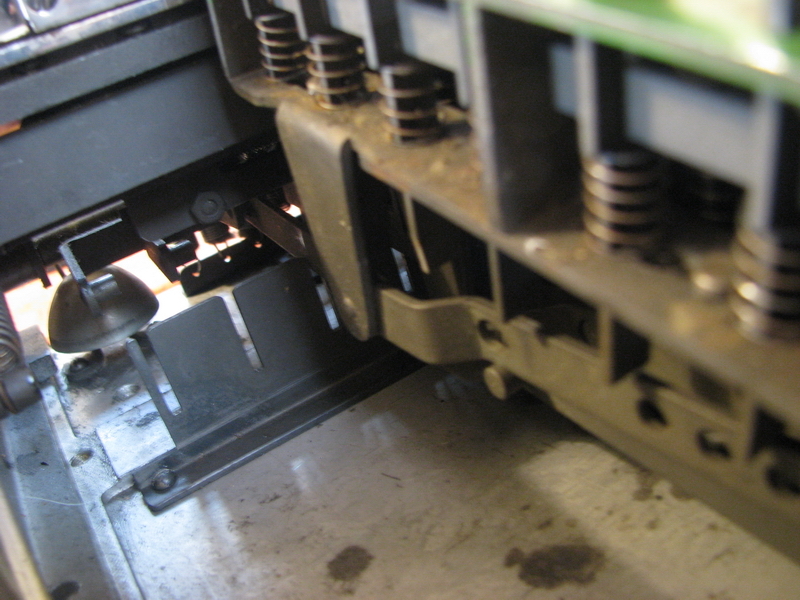 You can see one of the pins of the lever connected to the geared sector right in front of the bell, then another one to the right of it, and the third one is connected to the bar extending rearwards from the keyboard. 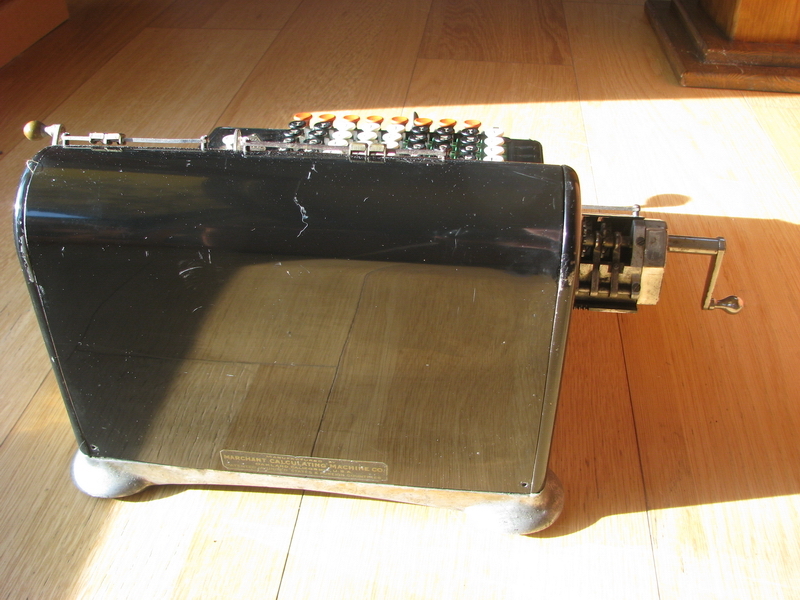 Below is a picture of a loose slice of keyboard, with the scissors dsconnected - the pin on the bar on the bottom goes into the leftmost hole on the bar on top. The problem now is that the keyboard is incredibly sensitive to the slightest deformation of the bars (which are rather thin steel) as well as to the front-to-back position of the keyboard column, as well as to the up-down position of the front part of the keyboard. 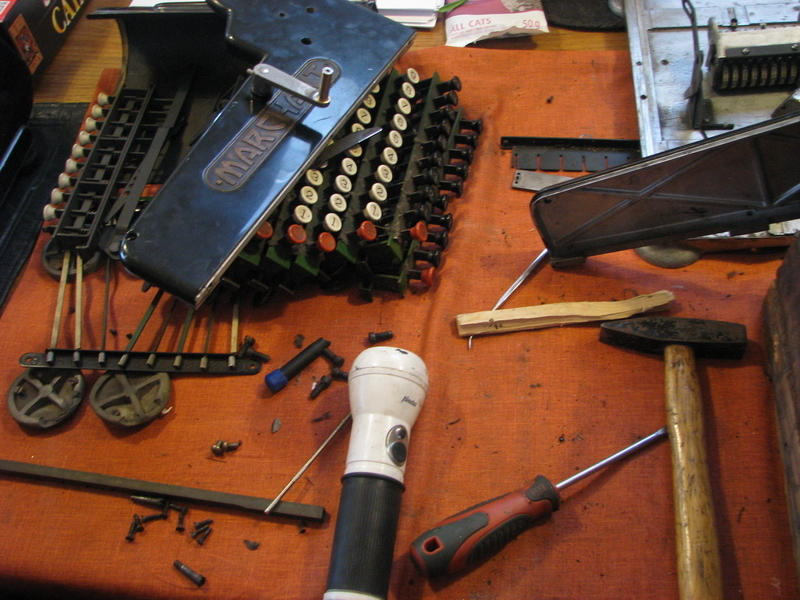 The keyboard can only be disassembled and reassembled by taking the scissors underneath the column apart, feeding the longer bar with the hole through the guide slot, hooking it up to the pin connected to the geared sector, then wiggling the column into place, which is made more difficult by both the presence of the clearing mechanism and the disconnected connection point of the "scissors", and then finally get this pin conncting the scissors through the hole in the second bar. In column 5 of the keyboard, there is also the bar for the carriage movement to contend with. So with some difficulty, I reassembled the entire keyboard...for the first time. 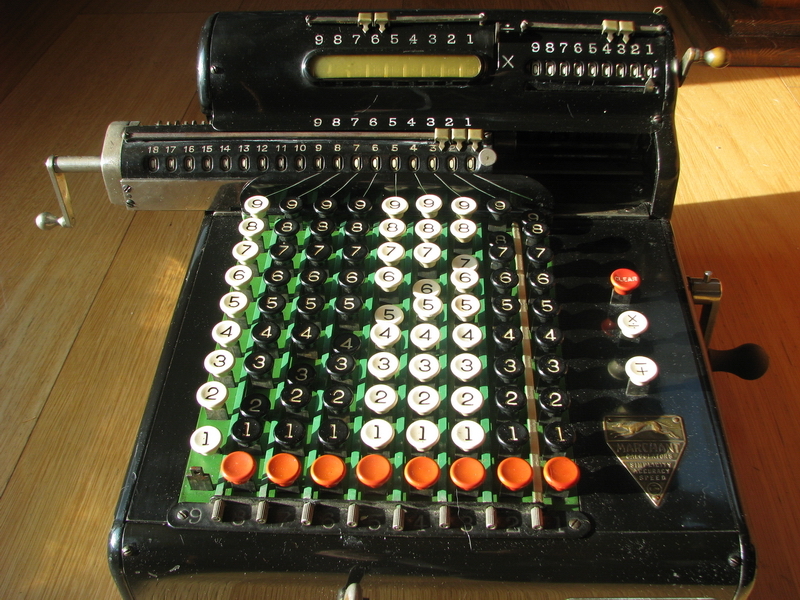 When I tried it, and typed "111111111", the indicators on the calculating cylinder didn't line up with each other, or with the slot in the top cover, and were in fact all over the place, indicating anywhere from 0 to 3. Woops. 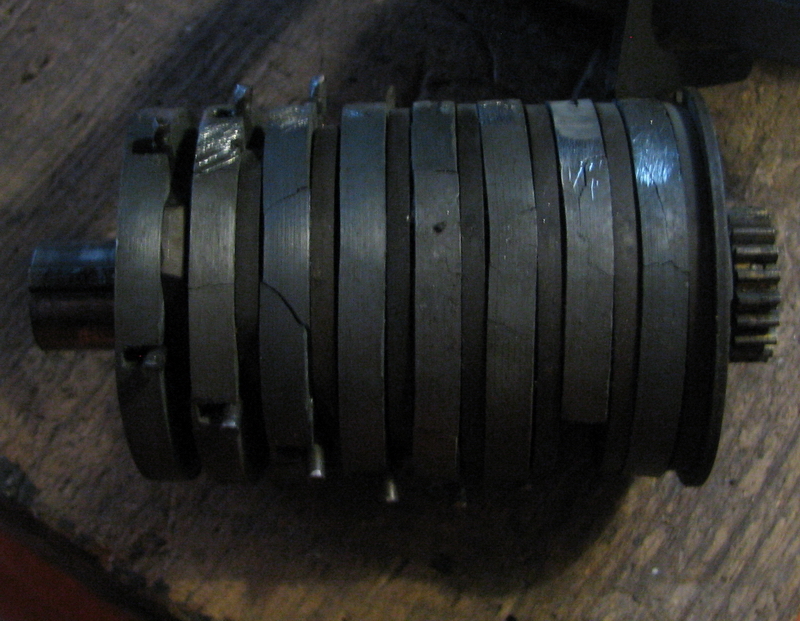 Another round of disassembly ensued, carefully noting which columns indicated too high, and which ones were too low. I thought maybe I had mixed up the order of the keyboard columns, and that that was the reason for this fiasco. Switching them out didn't help much either in getting things lined up again though. Another interesting feature of this machine is that you can only actually try out the keyboard when you assemble it completely, put the bar at the front of the machine in place to set the height, and screw all the keyboard colums to said bar, because every manipulation will slighty change the position and orientation, and as I mentioned, any tiny adjustment causes large differences in the number that is actually being set. So in the end, after two evenings punctuated with language that does not bear repeating here, I made up my mind that I would have to resort to tweaking the extension bars to the geared sectors. That went surprisingly easily, and the effect was surprisingly large. 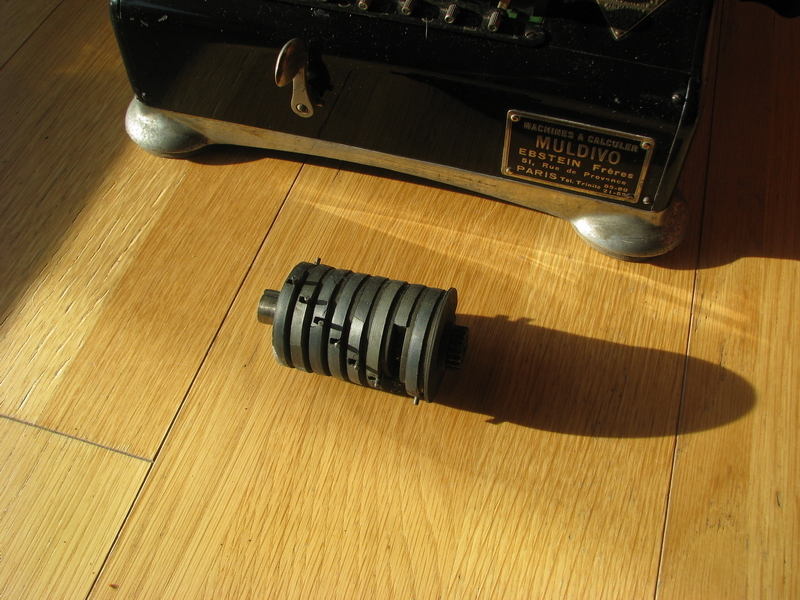 So be warned that the act of disassembly of a Marchant keyboard is more or less guaranteed to screw up the alignment, as a lot of fidgeting is required to get it apart, and you will without any doubt whatsoever end up bending the bars out of adjustment. After disassembling and reassembling keyboard columns 1, 2 and 3 about four to five times each (too low ...still too low ...oops, too high... too low again ...) I finally figured out a technique that makes this adjustment somewhat bearable. Tweak the bar on the keyboard column down, so you have about a mm between the bottom of the 9 key stem and the bar itself when you turn the keyboard upside down. That is adjusted too high, so when you assemble the keyboard column and key in a "1", it will read anywhere from 2 to 4. 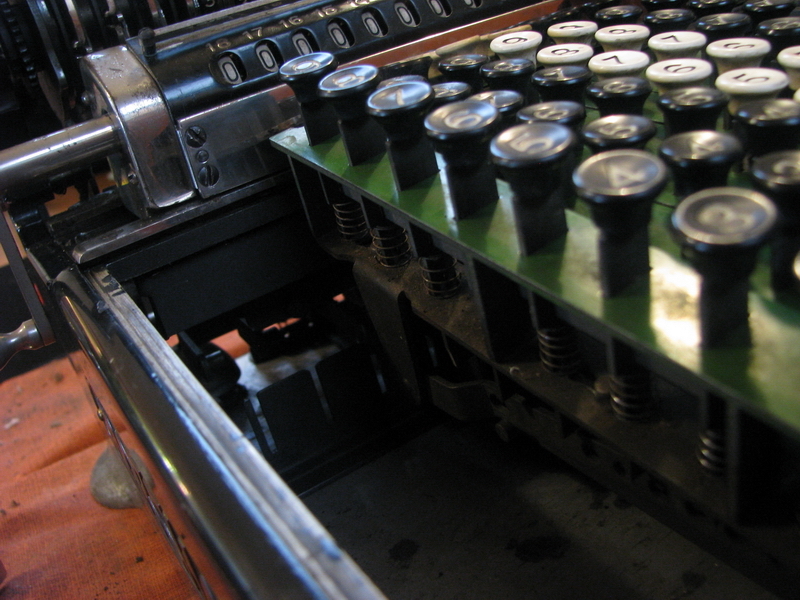 Then you go to the back of the machine, key in "4" on the keyboard, and press down on the bottom of the geared sector, deforming the bar until the 4 is at the correct level. Don't overdo it though ... if you bend it too far, there is no other solution than to disassemble the column in question and start over again. Which obviously I had to do a few times more - but I got it right in the end. The only issue is that the celluloid covering the setting register indicators is so yellowed that you can't see a thing anyway. 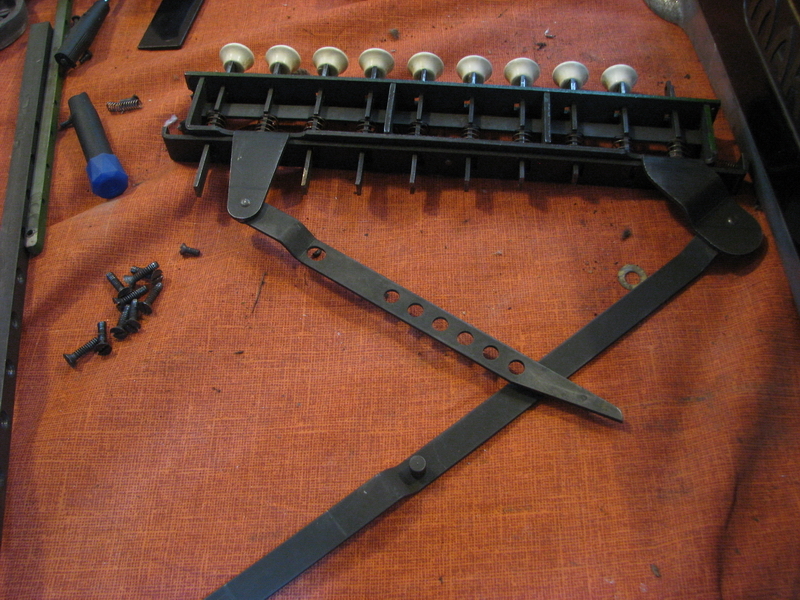 So after about 8 weeks of lingering on the dining room table, I was finally able to complete the reassembly. The new tens' carry cylinder isn't perfect - there are two positions in which it refuses to carry int he forward direction - these two pins just block for some reason, and I cannot find what the issue is, so the usual test of one negative turn with the machine in positive mode will simply block it on position 4 in the counter register, and the cover needs to come off to set it free again. Some judicious filing of the tens' carry teeth might still do the trick, but for now I am happy with this machine, carried home from Paris, and subsequently brought back from the dead. The red clearing key that is still missing will be made up in short order. 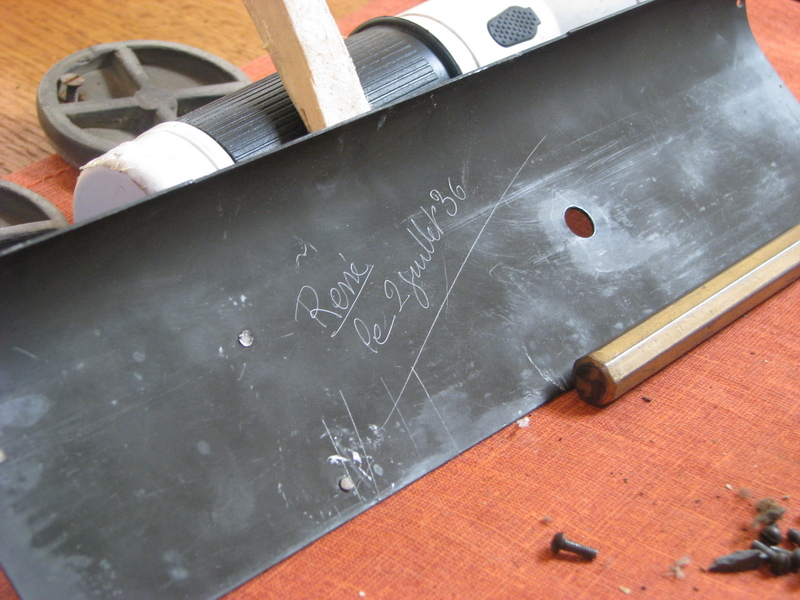 Another funny thing is that a certain "René" worked on the machine on July 2nd 1936, and scratched his name and the date at the back of the front cover. This must have been for maintenance or repair though, because the machine itself is earlier - the serial number is H-9-5921. 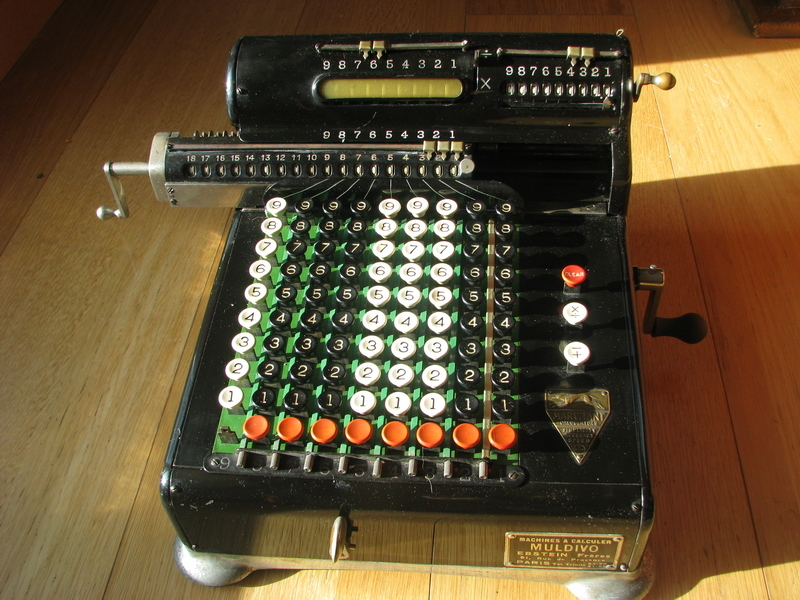 The model was introduced in 1927, it is hard to figure out whether they started the H model range with serial number "0001". Machine 6253 still looks the same as mine, metal plates, carriage movement system and location of the clearing knobs on the right panel - later they will change to a selection knob for + or x and a clearing knob more towards the bottom of the panel. 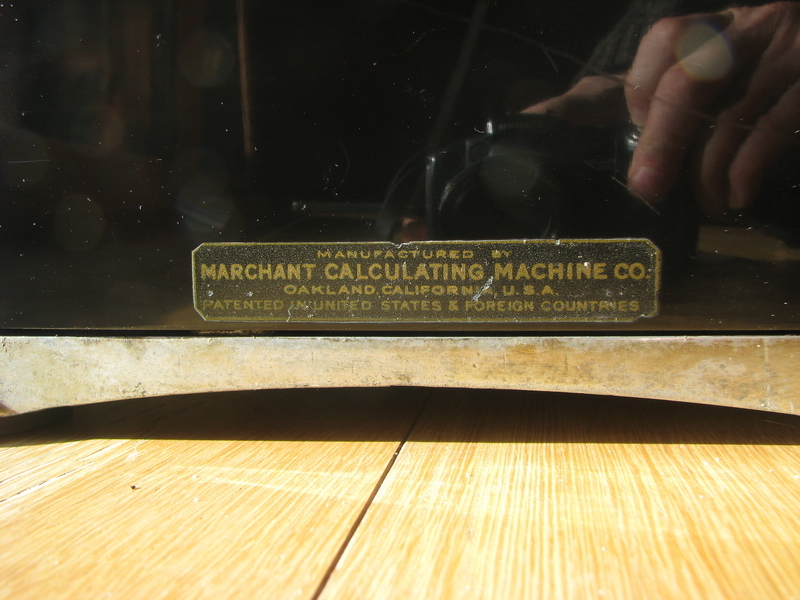 What is certain is that in 1933 the cast metal plates at the sides of the machine were replaced with decals, and at some point the carriage was modified to the system in use on the later XL machines, see e.g. 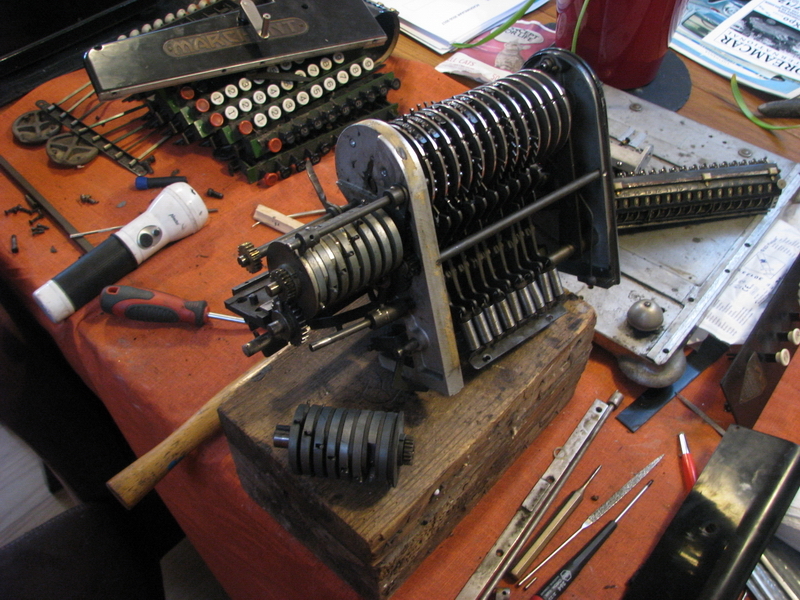 John Wolff's web museum and machine nr. 11900 there. So this specimen will probably date from between 1930 and 1932.